Home > Posts Tagged "DIY House Renovations"
When you are doing your own home renovations there will be many jobs that require you to reach up to high places. Painting the walls and ceilings is just one of them. 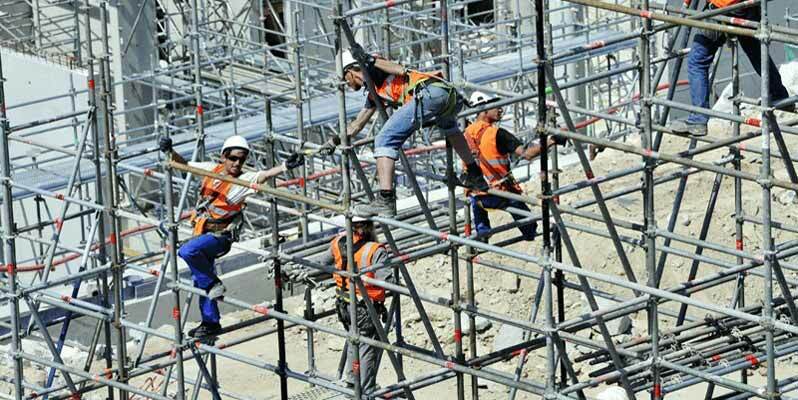 It is very important to have safe scaffolding for these jobs so that you remain safe while doing them, and so the jobs are much easier to accomplish. Without scaffolding to support you, it is possible and even likely that you could have an accident or a fall, through overextending your reach on the ladder. In fact, the ladder is not all that safe whether it is inside or out. Inside, it can slip on the floor and outside, the ground can sink under one leg and cause the ladder to tip, throwing you off balance. If you are a handyman, you may be able to make your own scaffolding, especially if you can weld. You can prepare it carefully and ensure it is attached to the outer walls in a way that will prevent you from falling. It gives you a wide and stable surface you can stand on to operate power tools or wield a paintbrush from. In addition, you can create a long piece of scaffold that enables you to paint a whole wall without getting down, so the job will be done much more quickly and you won’t get as tired. Every building job requires support of some kind, even if it is minimal; for instance, a one-storey home on flat ground. You still need to reach up to those walls and ceilings to paint or do the renovation you had planned.